Wallets are familiar objects; almost anyone has one. The word “wallet” has been used since the first century AD, but the modern wallet design become standardized in the early 1950s. 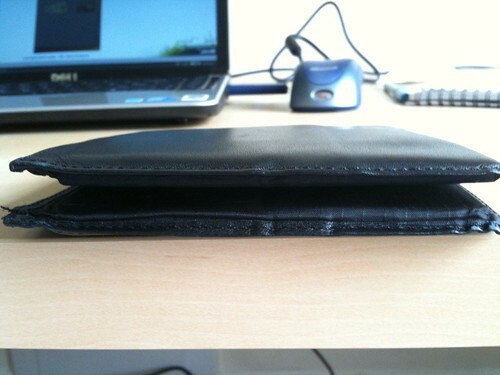 A modern wallet generally has one or more currency pockets, multiple card slots, and sometimes a coin purse compartment. Wallet designs, around the world, are so similar to each others, hence the implicit assumption (intentional or unintentional) is that people use wallet in a similar fashion. However, it does not seem so. For example, in Vietnam very few has credit cards or bank cards (checking or saving accounts), hence people do not need to carry many cards in their wallets; many only carry an identity card and a driving license. Coins are not popular; the government introduced coins few years ago, but there is no needs for coin usage. Some shops even refuse to take coins as they care cumbersome. Therefore, people mostly use wallets to keep cash. In fact, many people don’t even have wallets. In contrast, a person living at North Americas – or an industrialized country – needs to carry many things in his wallet: cash (bills and coins), credit cards and bank cards (very often up to 10), a driving license, an ID card, various discount or membership cards (Safeway, Costco, Marcy, Bestbuy, etc. ), insurance cards (dental, medical, optics), and many others. There are easily more than 20 cards a person carries around all time, yet this is a conservative number. As the result, wallets become very thick. For sure it is not comfortable to wear or to sit on, as wallets are usually kept in back pockets . Since people have different needs, a standardized wallet design is not suitable for everyone. From this point, I would limit the discussion within urban life of industrialized countries. A most visible need is to carry a lot of cards. The current (common) design, which has been standardized in early 1950s, does not fulfill this need. Many major designers including Gucci, Louis Vuiton, and Armani don’t seem to realize this problem. They certainly create luxury and good looking wallets, but I doubt very much they considered the actual practical needs of users. The company markets this new design under the name All-ett Billfolds. I am very happy with this purchase, because the new wallet is so thin that I have no problem carrying it around and sitting on it all day. There are few design innovations that make this wallet thin. The most important one, IMHO, is the new layout which has four pockets for cards. This design spreads out the cards into 2 stacks, instead of stacking all cards in one stack as with traditional wallets. Also each pocket can keep multiple cards; this reduces the material layers in between cards. With a traditional wallet, each card pocket or slot you only can keep 1 to 2 cards. This new layout makes the cash pocket much deeper than normal US bills. Another good design of this wallet is that there are two cash pockets with different depths, hence bills are spread out as well. Last, All-ett are made of a nylon material thinner than the traditional leather. The result is a very thin wallet. This wallet is slightly bigger than a normal bi-fold wallet, however it fits nicely in a Levis back pocket. A bonus point, which I learned from Max, is that if you turn the all-ett sideway and manage to put it in a Levis back pocket, you are safe from pickpocketing. This is mine with 16 cards. Nothing is perfect; there are two minor issues. First, there is no coin compartment; second, the material feels cheap. While, there is no easy solution for the first issue (I put coins in the front pocket nowadays), I wish they can use some other materials to give a better texture. fn2. I assume wallet users are mostly male.